Barney (The Purple Dinosaur) Goes to Bohol! We were surprised to find Barney (the lovable purple dinosaur) when we visited the XZootic Animal Park in Bohol yesterday. Our son wouldn’t want to get inside the cage of a Burmese python for picture taking because he was afraid to get near the huge snake. I was hesitant, too, at first, but the crew handling the snake assured us that it was harmless. That picture will appear in my Mommy Moments’ post this Friday. However, when Justin saw Barney, he forgot about his fears and gamely posed for a picture beside his favorite dinosaur character when he was a toddler. I guess that’s because he knew nothing bad would happen to him if he stood close to Barney because he as we all know, Barney is every kid’s friend. Souvenir items were also sold at XZootic Animal Park. They weren’t selling brain teaser puzzles there, but they had a lot of tarsier shirts, bags, purses and key chains. We bought a few items including a boat key chain that my son really liked. 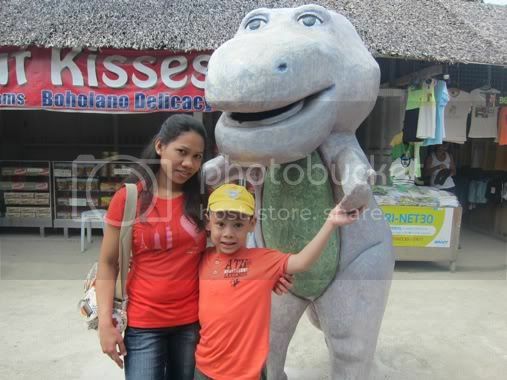 This entry was posted in Barney, Bohol, XZootic Animal Park. Bookmark the permalink.